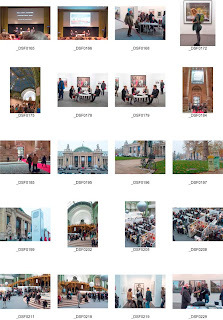 · Some images taken outside the event that would set the (‘grand’) scene; that might indicate the elitist angle; that might position the event as ‘divorced’ from the ‘real world’ – or make a comparison at least. · To follow up the ‘elitist’ theme inside the event – the VIP Lounge & its grand staircase; the ‘types’. 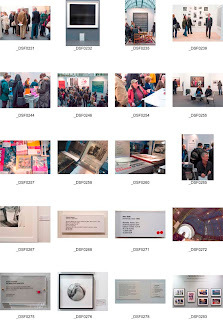 · And, of course, busy photos of activity and movement. I implemented most of these to some degree, with varying success; and also added detail shots, including some ‘price labels’ to indicate the monetary values being asked; some images to stress the importance given to photobooks in the event; and naturally a few responses to opportunities for juxtapositions etc. 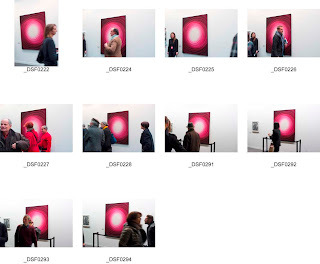 In connection with the latter angle, I spent some frustrating minutes trying to implement what seemed like a good idea at the time – capturing someone’s head against the white central area of an abstract, colourful image that was positioned close to the entrance. There were always too many people around (including an attendant who was discouraging ‘punters’ from brushing against this particular piece and became suspicious of me ‘lurking’) or I just missed timing it correctly or it wasn’t a very interesting head ... However, I’ve included some of the results below – partly because it illustrates how easy it is to waste one’s time pursuing what would not have been that great a shot anyway, but also because I think there is a certain something about the shots when they appear together in this way. Perhaps, chiefly, there is a testament to the folly of trying to be clever! However, over the last week, I’ve had the chance to review my 100+ images and have narrowed them down, so far, to a long list of 44. I’m not 100% happy with my handling of the new camera, in truth. I did admit it was a risk. It performs well in the lowish light of an exhibition-type environment and was, in many ways, ideal for the job. But I was less used to handling it and sometimes didn’t quite get my settings right. More importantly, I think I made a few basic technical and handling errors – even hand movement at times, which is irritating and has been the reason for discounting some of the images. However, I do feel that there will be enough workable results from this 44 to deliver a satisfactory result on the assignment. 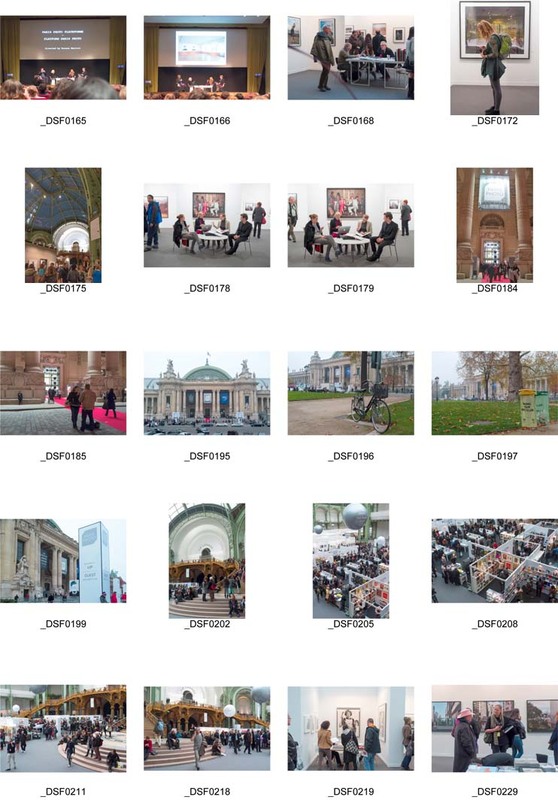 I’ve included that set as a set of contact sheets. My tutor suggested this approach after Assignment One, so here goes. Next step is to work out how I’m going to handle the submission; how many to submit; and, of course, which to select from this full set. They’ve only had some basic processing at this stage, so there will be more work to do on the selected images anyway.